The son of a sharecropper, Joe Louis (1914-1981) rose up through the ranks of amateur and professional boxing to become the world heavyweight champion, a title he held from 1937 to 1949. 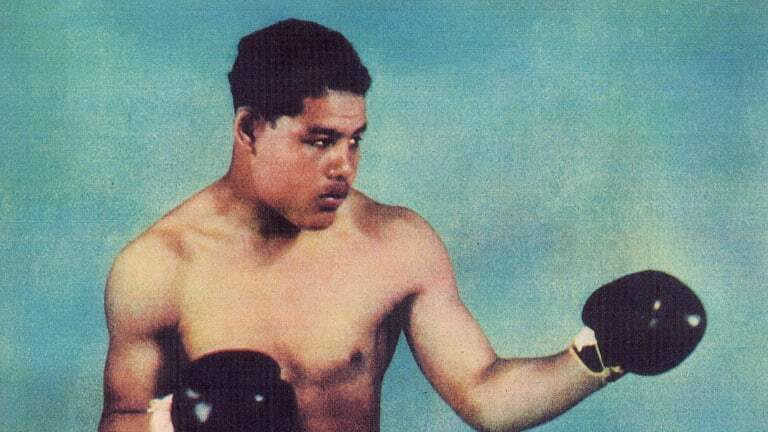 Louis is perhaps best known for his legendary matchups against German boxer Max Schmeling. Schmeling defeated Louis when they first fought in 1936, and in the runup to their 1938 rematch, the press imbued the bout with international political significance, portraying the match as an epic battle between Nazi ideology and American democratic ideals (even though Schmeling was never a member of the Nazi Party). When Louis defeated Schmeling by knockout in the first round, Louis became an American hero. The son of Alabama sharecroppers, Joe Louis, during his reign as heavyweight champion of the world from 1937 to 1949, stood as a shining symbol of mythical and real American traits like racial unity, national strength, and unlimited opportunity. 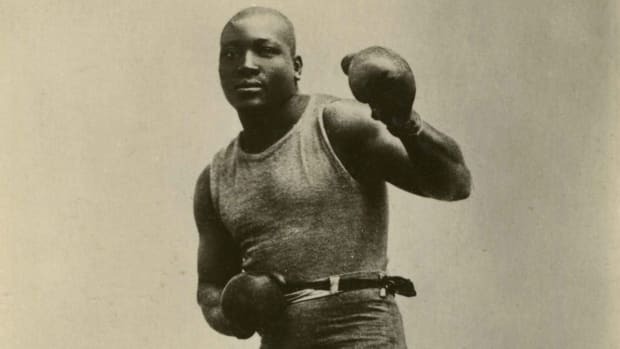 Through a rare combination of shattering events, an acceptable demeanor, expert handling, sympathetic press coverage, great pugilistic talent, the American obsession with sports, and the peculiar symbolism of the heavyweight boxing champion, Louis became the most popular black in America and one of the most popular of all Americans. Did you know? 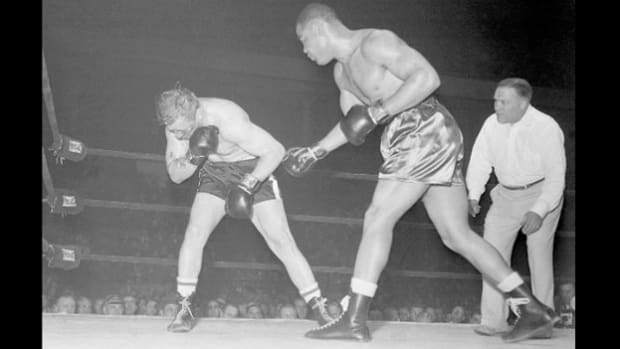 From 1934 to 1951, Joe Louis fought 71 matches and won 68 of them, 54 by knockout. 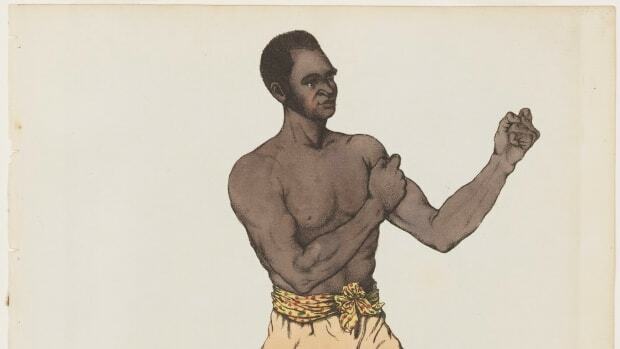 Although Louis established a phenomenal fistic record-he successfully defended his championship twenty-five times in twelve years (four of which were spent in the army)-what helped immortalize him was the context in which his fights took place. In his 1935 defeat of the giant former heavyweight champion Primo Carnera, who was viewed as Benito Mussolini’s emissary, Louis represented blacks who identified with ‘little’ Ethiopia in its struggle against the bullying Italian aggressor. By becoming the first black to hold the heavyweight championship in twenty-two years with his victory over James J. Braddock in 1937, Louis lifted the spirits of the black masses in the midst of the Great Depression. 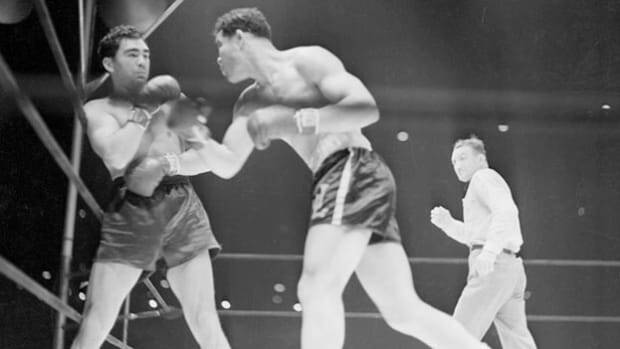 At the same time he gained white acceptance because of his ‘humility’ and willingness to avoid the provocative behavior of the previous black champion, Jack Johnson, who had antagonized white America by not ‘knowing his place.’ By ‘destroying’ German Max Schmeling in their second encounter in 1938, as Adolf Hitler and the Nazis rose to power, Louis provided some assurance that America’s best could beat the best that Germany had to offer. Louis continued to win white approval thereafter by joining the army, although he never saw combat. Despite his remarkable achievements and tremendous popularity, Louis may be as important for what he did not accomplish as for what he did. 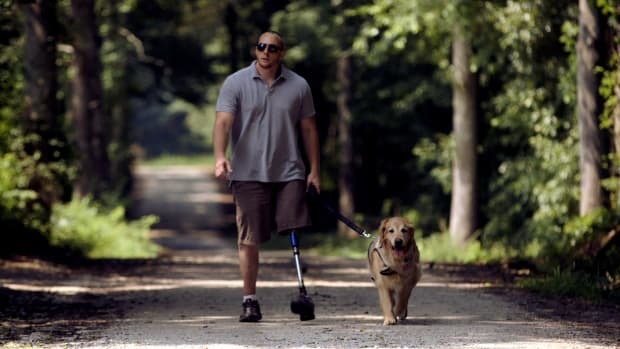 Like many heroes he has been credited for much that he did not do. Commentators, for example, have overstated his impact on racist attitudes and practices. There is little evidence that Louis’s success or that of other black athletes translated into a general acceptance of blacks or recommended them for roles outside sport. Where Louis did change attitudes was among blacks. 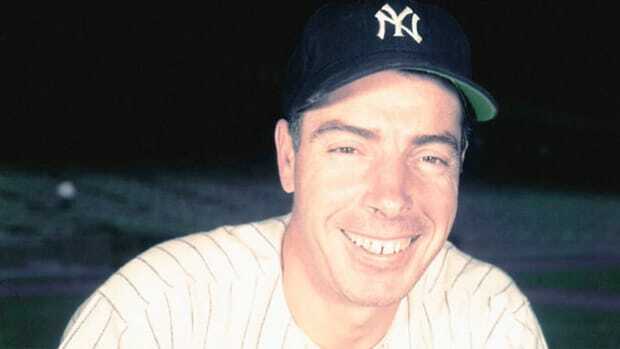 His position at the top of his sport, his celebrity status, and his public image helped bolster the confidence of a people whose heroes were rarely accorded white attention or respect. In the difficult time of war his decision to cooperate with and become a symbol of a government that was far from fair to him and his people offered a constructive, albeit imperfect, course of action. In the end, Joe Louis was another edition of the American myth of the self-made man-that anyone who is industrious, patriotic, and moral can rise from the very bottom to the top of society where wealth, power, and fame await him. As with Louis, not all self-made men are as they appear to be. Not only did he have a lot of help; his wealth was more illusory than real. 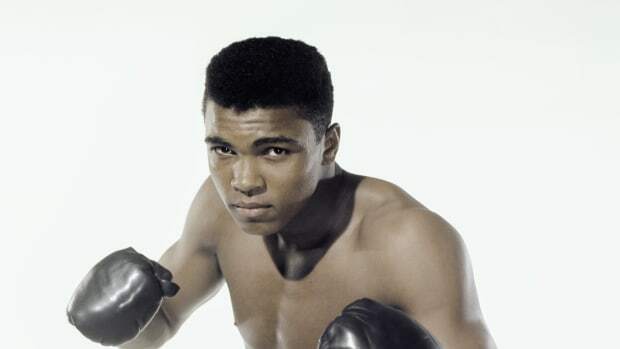 For all his greatness as a boxer and a symbol, Louis, in reality, was simply human. Two words best describe his personal life, excessive and irresponsible. Louis lived far beyond his means, supported far too many charities, and lost a small fortune to golf hustlers alone. 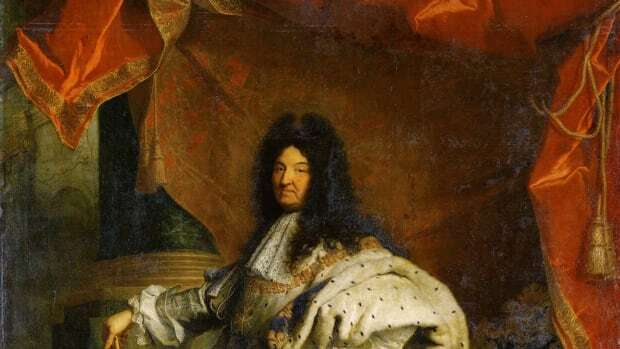 Worse was his notorious penchant for adultery, which cost him a loyal and loving wife. At the end of his boxing career, Louis had neither money nor family and faced an insurmountable federal tax debt, which the irs forgave after considerable legal and political pressure. In his twilight years Louis struggled with a drug problem and served as a ‘greeter’ at Caesar’s Palace in Las Vegas, where he shook hands with common folk, gambled with house money to lure others, and played golf with high rollers before failing health incapacitated him. Yet, Louis’s interment at Arlington National Cemetery indicates his place in myth and history; for, right or wrong, this is the public record on which society judges its heroes.